Why is Fundraising important for Nonprofits? It is a crucial component which establishes reciprocity between Nonprofits and donors. The shared passion of a Nonprofit’s mission and the donor’s support with time, energy and finances is valuable for a community. Fundraising has lot many benefits than just fulfilling monetary needs of a Nonprofit. Capterra mentions that online fundraising increased by 13.5% in the United States in 2013. 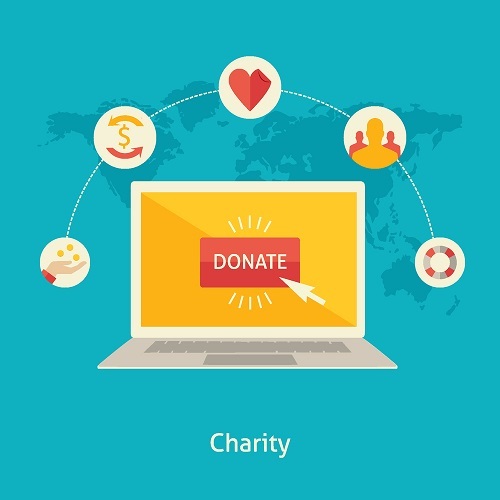 In this context it becomes essential for Nonprofits to be equipped with an eye-catching landing page for donations to be made and once the destination page is complete, the next vital element is an effective donation gateway or tool. Listing a few online donation tools for Nonprofits which can set the process rolling. Fundly allows you to create a free fundraising campaign in minutes and raise funds for any cause. It is an easy to use donation platform which is helpful and scales to any size fundraiser. Fundly is free to create and share your online fundraising campaign but 4.9% fee from each donation that Nonprofit’s receive is deducted. A small credit card processing fee of 3% will also be deducted from each donation and discounts for larger campaigns are present. Fundraising guides help first time fundraisers and regular subscribers alike. Through FundRazr Nonprofit’s have access to the world’s largest social network to raise more online funding for their cause. 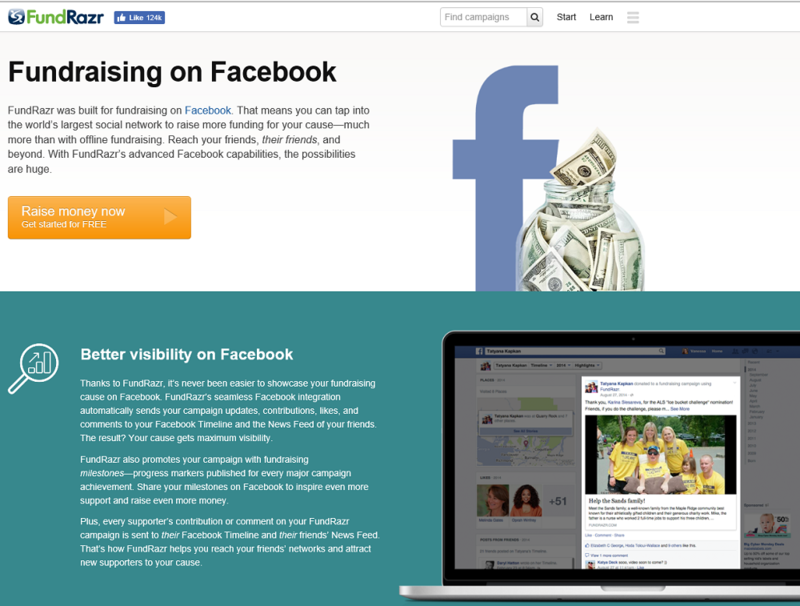 FundRazr’s faultless Facebook integration automatically sends campaign updates, contributions, likes and comments directly to your Facebook Timeline and Newsfeed of your friend thereby getting maximum visibility. Every supporter’s or donor’s contribution or comment on your FundRazr campaign is sent to their Facebook Timeline and their friends’ News Feed. FundRazr helps you reach your friends’ networks and attract new supporters to your cause. Through FundRazr campaign on Facebook. You can Email, Embed, Follow, Like, Link, Pin, Publish on Page, Send, Share on Google+, Share on Linkedin, Tweet, and Add on tab on your Facebook Page. Nonprofits can reduce their fundraising costs as FundRazr deducts a small 5% fee from each contribution. Qgiv engages donors’ through mobile-friendly tools, responsive fundraising pages, texts which helps in the growth of donor base. 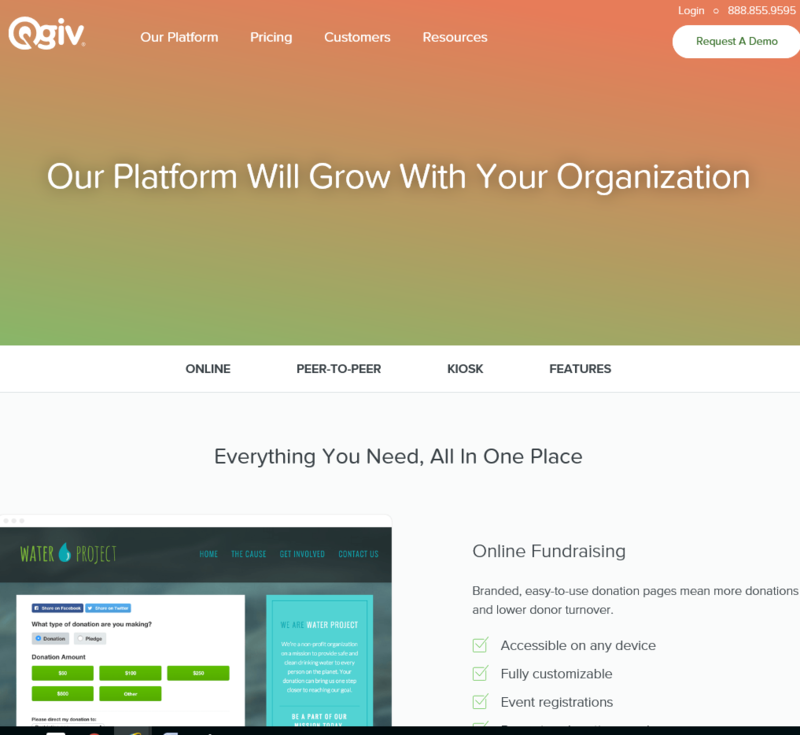 Nonprofit’s can see a broad overview of their organization’s constituents or a detailed report for a specific event or campaign through Qgiv’s powerful management and tracking tools. Donation pages can be build by Nonprofits with Qgiv’s simple tools or embed a form into a page on your website that inspire donors and supporters. Makes donation experience easy for donors through simple forms and processes. Thanking donors by sending them receipts that are tailored to address the specifics of their gift. Qgiv’s custom receipting system makes it easy. Qgiv’s believes that engaged donors are more likely to support in the future and has handy reporting system to segment and target donor communications and outreach. 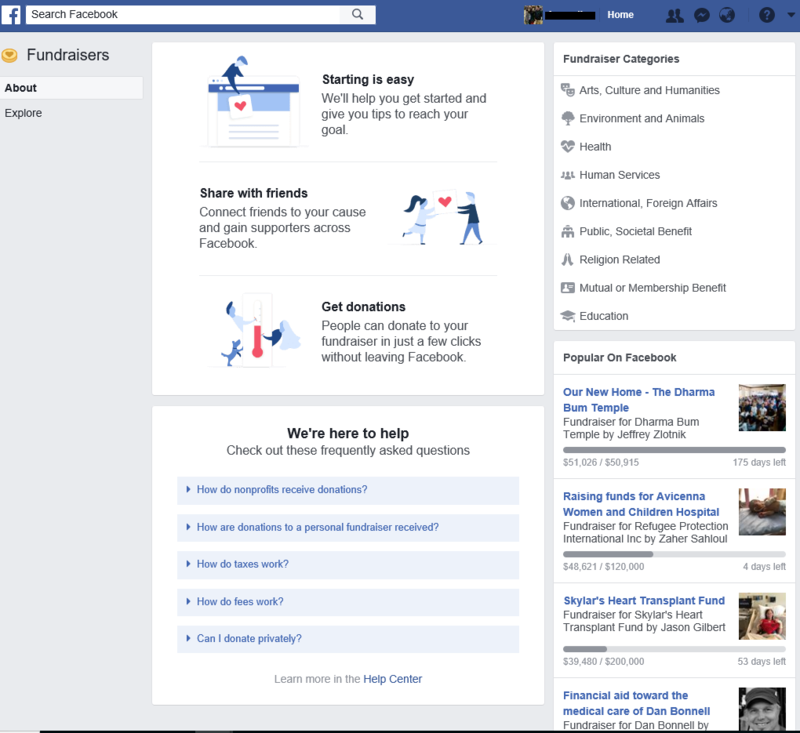 Through Facebook Fundraisers nonprofits can raise funds for their cause by connecting with friends and gaining supporters across Facebook. 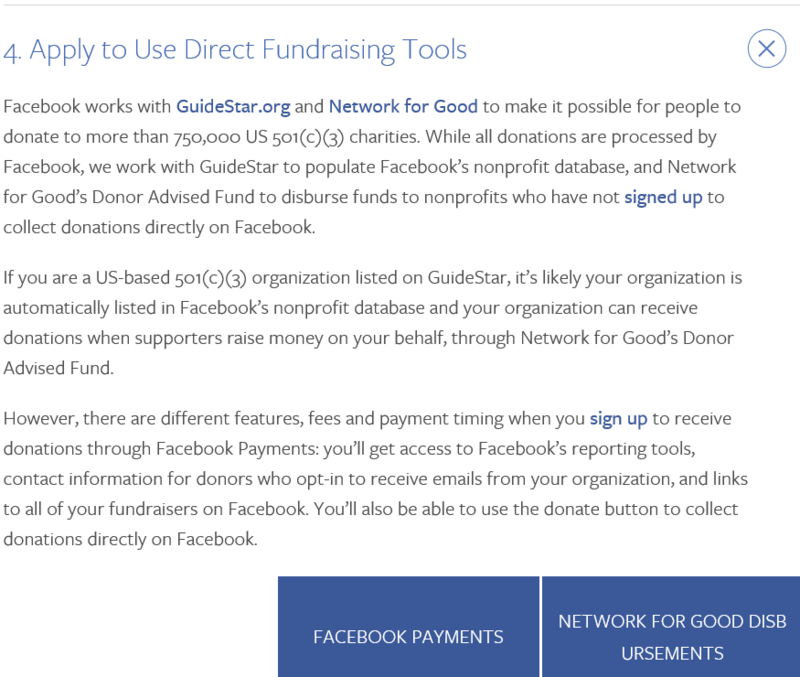 Facebook disburses donations to Network for Good once a month and then Network for Good disburses those donations to the nonprofit the following month. After you make a donation, a receipt will be sent to the primary email address listed on your Facebook account. This receipt confirms that you’ve made this donation as a charitable contribution and that you’re not receiving any goods or services in return. The fee for nonprofit donations disbursed by Network for Good is 5.75%. This fee covers payment processing, nonprofit vetting, payment support, operations and fraud protection. Nonprofits and Philanthropic no matter how big or small your budget needs management software to be competitive. Click&Pledge shall deploy as much of software as an organization needs ranging from a simple one-page donation form, to full-fledged e-commerce experiences and donor management systems. The site costs $700 for us to set up and if the Nonprofit would like an online payment processing, a monthly fee ($14.95 or $29.95) has to be given depending on how low you would like your donation processing rates to be. It adheres to PCI DSS compliance standards security norms. Click & Pledge allows you to sell items on top of collecting donations; they support pledges, offer extensive customization, integration with various tools like mobile, and have different pricing packages to meet organizational needs. 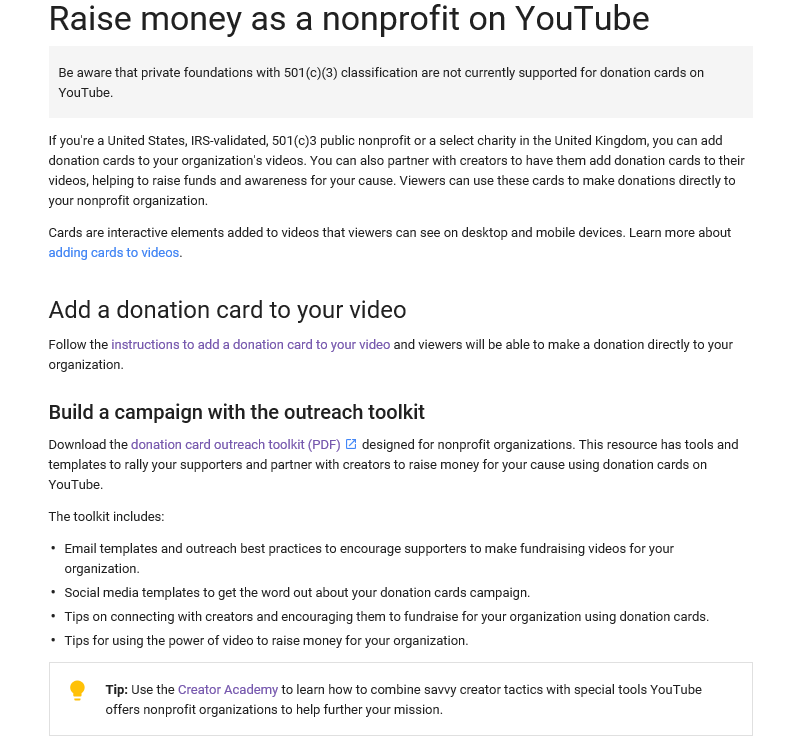 Nonprofits at US and UK can add donation cards to their organization’s videos which shall be used by viewers directly to make payment to the Nonprofit. Google covers the processing fee, so the organization receives 100% of money donated. The outreach toolkit has email and social media templates with best practices and clear guidelines as to how to process. When a donor gives money through PayPal, it shows up on PayPal account within minutes. From there, transfer it to your organization’s bank account at no charge. 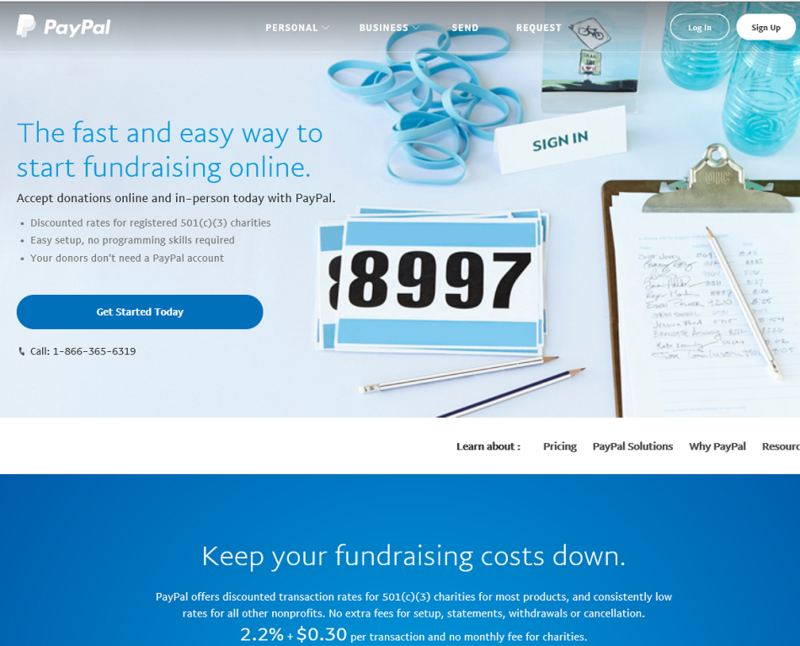 Monthly statements, downloadable logs, and instant transaction searches are components of PayPal account and controlled access to Nonprofit’s employees or volunteers for mailing donors. Automatic fraud screening helps protect you and your donors as PayPal is PCI compliant. PayPal is trusted by many donors, and is also one of the cheapest ways to take donations. There is a scope to add a donate button to your fundraiser website. More nonprofits are using PayPal to accept donations than any other tool and donors are not required to create their own PayPal account to donate, they can just use a credit card. The per transaction fees are 2.2% plus $0.30. 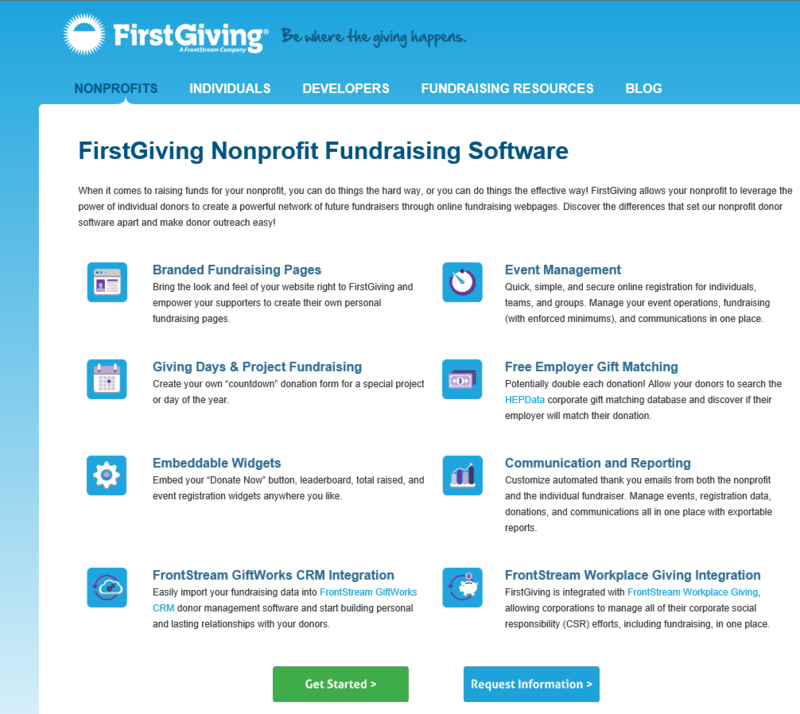 FirstGiving provides online peer-to-peer fundraising tools to manage nonprofit’s events, grassroots campaigns, direct donations, and donor communications. FirstGiving offers additional tools, including peer-to-peer software, to take your campaigns to the next level! Progress can be checked via visual charts that benchmark events and assess year-on-year performance. Fundraising pages can be created within the registration process allowing supporters to join your cause immediately. The standard fee per donation is 7.5% (5.0% support and enhancement of the product + 2.5% credit card fees). Event registration costs 4.25% for online events. 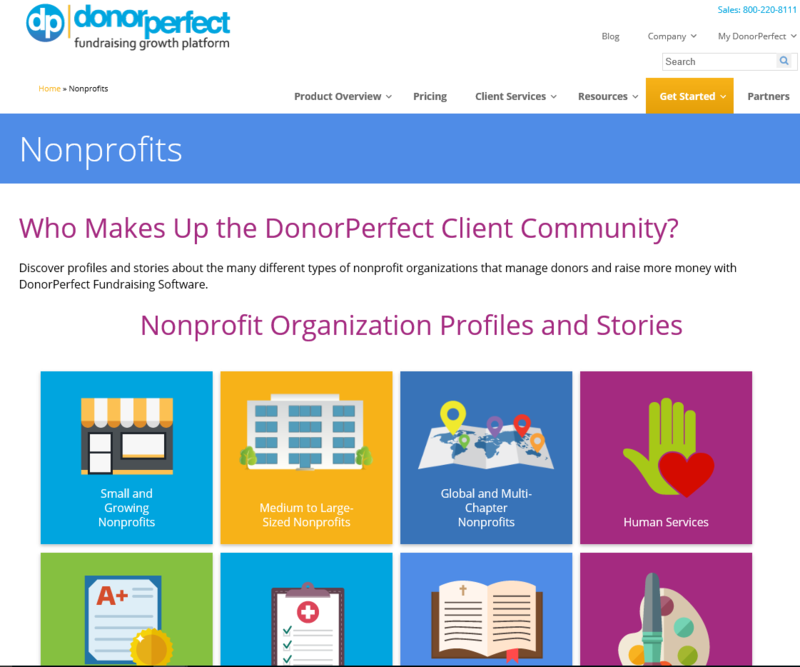 Nonprofits subscribing to DonorPerfect can generate and manage online donation forms that integrate with DonorPerfect templates and they also have the option to create or customize a form for an additional fee. It helps to grow your database of donors, increase giving and retain donors year after year. Donors Cover Costs option allows constituents to ensure 100% of their gift goes to the fundraiser by adding extra donation to cover payment processing costs. DonorPerfect Payment Services ensures donor’s account data is securely stored in a PCI-certified gateway and not on computer or network. Donor Perfect personalizes messages about Nonprofit’s cause which helps you stay in touch with donors and promote continued support. Focused solicitations reap better results and DonorPerfect has the most powerful and easy-to-use filtering tools to enable you to precisely target your solicitations. Donor Box has pre-filled custom amounts with descriptions to let your donors feel great by knowing what they’re contributing to. Donors have full control over their monthly recurring donations as it integrates with Salesforce (CRM platform) Nonprofit Success Pack. Accept donations on Nonprofit’s Facebook Page. It is secured by SSL/TLS. PCI compliant and Credit card information are encrypted, tokenized, and safely stored with the Stripe payment processor. DonorBox does not store any card or bank data. Nonprofit’s can embed a donation widget directly on your website or create a dedicated donation page with your own branding. 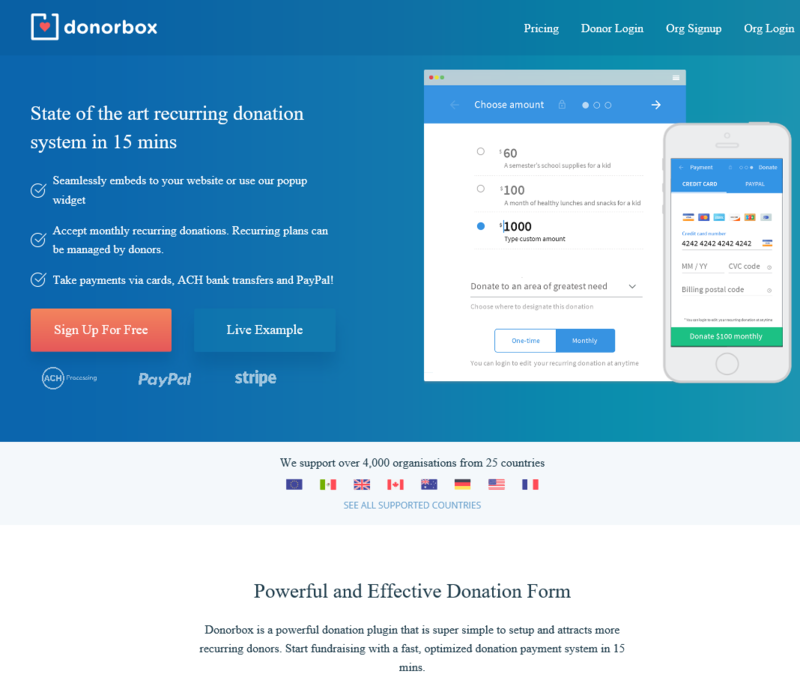 DonorBox is free if you get less than $1k in donations for a month. If you reach $1k for a month, Nonprofit’s are charged a small platform fee of 0.89% for the month’s donations. Other donation platforms charge 2-5% or more.